Today I bring you some printable Valentine's day goodness. Hooray! I was inspired by airheads red balloon logo and decided to try making a red balloon cookie topper out of their candy. And guess what? Cutting airheads with scissors is super easy and fun! 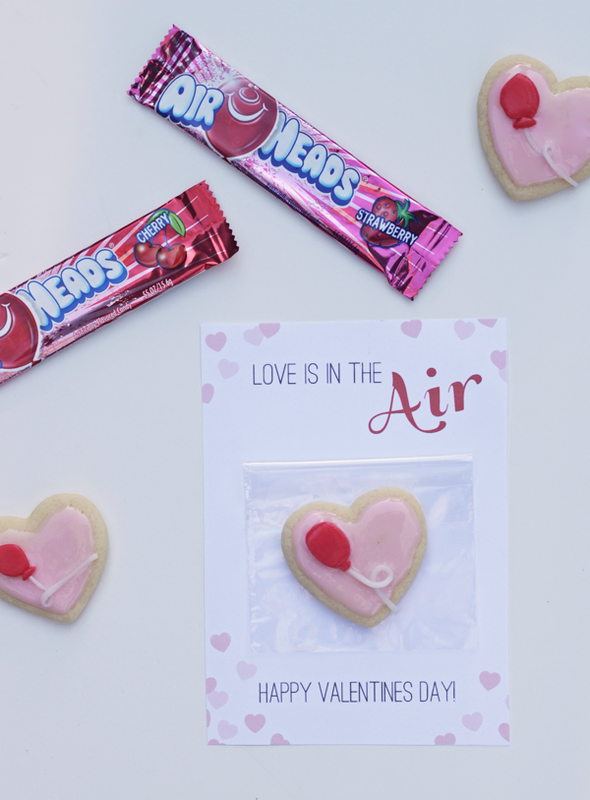 Pair that with a little valentine wordplay, some pink hearts and a simple sugar cookie recipe... and we've got ourselves one uplifting DiY. Full disclosure: airheads is hosting a craft contest and the winner gets a ticket to Alt NYC. Yeah, I'm down with that. Wait, scratch that... I pretty much never enter contests, so the fact that I'm entering this one and blogging about it means I'm pretty freaking over the moon psyched about that! I have no idea if it helps my odds, but if you like this project, can you help a sister out and vote for it on the airheads facebook page? You can vote HERE once a day until Feb 11th. Read on below for a simple tutorial on how to make these balloon toppers, along with the printable and recipe for some pretty addictive cookies. Happy love day! 1. Download the free printable and print/cut as many as you need. 2. Bake sugar cookies as directed below and pipe with icing when cool. 3. To make airheads balloons: take a cherry airhead and trim out a small oval about a 1/2" in diameter. Cut a tiny corner off the end and press together with the oval using your fingers to mold into a small balloon tip. Trim a thin strip of the long end of a white mystery airhead. Roll along a clean surface until a thin 'string' is formed. Cut a 2" piece and form a small loop near one end. 4. Place balloon on upper left of iced heart cookie. Place string below balloon tip and run to edge of cookie (trim end if needed). Gently press into icing. 5. 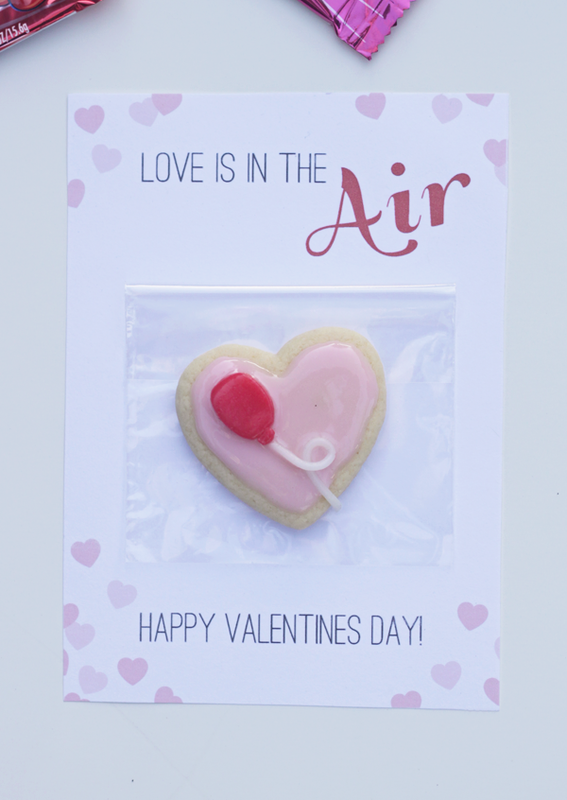 When cookie icing is hardened, place cookie in a cello bag and attach to Valentine with tape along top. 6. Don't forget to write in a valentine message to your loved ones before you give away these treats. Tip: If you're short on time, substitute the handmade cookies for a handful of mini airheads candy bars and you still have a cute valentine! 2. In bowl of electric mixer fitted with the paddle attachment, cream together butter and sugar on medium until fluffy, about 5 minutes. Beat in egg and vanilla until incorporated. 3. Gradually add flour mixture on low until combined. Wrap dough in plastic; chill 1 hour. 4. Heat oven to 325 degrees. On a well-floured surface, roll out dough to 3/16 inch thick. Cut out hearts. Transfer 6-8 cookies to an un-greased cookie sheet. Chill until firm, 15 to 30 minutes. 5. Bake 8 to 10 minutes, until cookies are firm but not browned. Transfer cookies on pan to wire rack to cool, about 20 minutes. 6. Repeat until all dough is used. 1. Whisk together sugar, milk and corn syrup until smooth. 2. Add a few drops of red food coloring until desired tint is achieved. 3. Pour icing into squeeze bottle or piping bag fitted with a small nozzle. 4. Outline cookies first, then fill with icing. Use a toothpick to fill in small gaps and air bubbles. Wow! These are super cute- thanks!